The Japs got there first with their dissection of the iPod nano - clickeh. Check out the cool shopping bags the Ginza Apple Store's giving out! 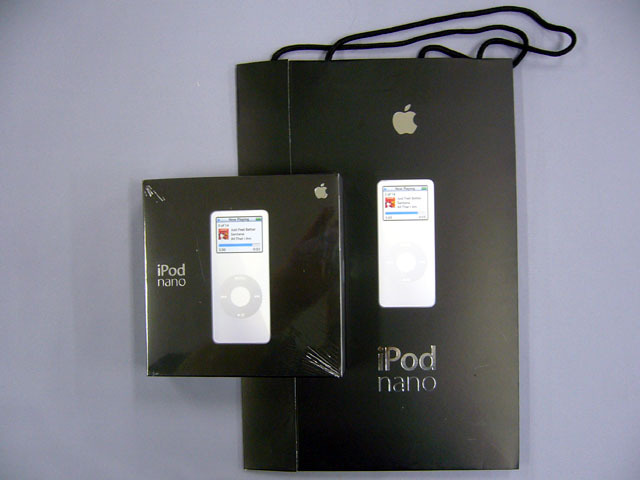 And at 1.6 inches wide, the iPod nano is narrow enough to fit in my small inner jeans pocket. Result! Nah, I'm happy with the ol' shuffle. I'm thinking of the nano as a Christmas present for someone else, though. Maybe you can help me - with your vast internet knowledge. Only this one is often not a guy thing - it involves shopping. I was searching for this DVD tree. Maybe I should make it myself somehow. The base would fit on the same amount of space as a smallish Christmas tree could fit. Any help would be greatly appreciated. Sorry, but all product(s) in the group you selected are discontinued and no longer available. and to tonight's unfortunate REUNION show on Fox). Go to http://demco.com/ , click "Furniture" on the left, then "Display", then the "CD/DVD Displays" link on the following page. You should find something similar to what you're looking for there. I made it that far and am seeing things interesting (not sure if my invention is one of them, but one of these will surely do); must peruse this further when more time and not so late. Thank you and say hello to God for me!